With us living in a multi racial country, I am blessed to savour some of the good Malay cuisine. As I grew up in the Chinatown area, I was exposed to limited Malay dishes when I was young. It was until I moved to the East Coast and having a Malay family as neighbour, I was introduced to more Malay cuisine. (yes, I still remembered the big spread of food served during a wedding that my neighbour invited). Then again, I was in my teens and food was the last thing I was interested in. I didn't know how to appreciate Tau Kwa but one such dish that changed my perspective was Tahu Goreng. You see, my hubby is a complete opposite of me. He grew up with Malay cooking and he was the one that exposed me to more interesting Malay cuisine. One such date was a meal eaten along some alley in Arab street. I must say this old man’s Tahu Goreng is to die for. It was so delicious that from then on, I always order it when I see it. During a recent visit to the library, I chanced upon a book that featured Malay Heritage Cooking and I was literally drooling on all the dishes. I tried one of the chicken dish and regretted not blog about it as I didn't manage to get a picture of the dish. Nevertheless, Samosa Daging Berempah (Beef Samosa) is yet another recipe that is a keeper. My girl walloped at least 6 pieces at one go. Pound ginger and garlic into a paste. Heat oil and stir fry ginger-garlic paste till lightly browned. Add minced beef and stir fry till meat is cooked. Add pepper and curry powder and stir till well combined. Add onions and coriander leaves and mix well. Cook for a further 5 mins. Set aside to drain and cool. Fillings has to be well drain to ensure cripsy samosa. Combine chillies and garlic in a blender and process into paste. In a sauce pan, gently stir paste with water and let it simmers. Do not boil. Remove from heat and stir in tomato ketchup, vinegar and sugar. Season with salt. Cut sprinroll skin into 3 equal strips. Cover with damp cloth to prevent drying. Using double layer of spring rolls (cripy texture). Fold the bottom left corner upwards to form an equilateral triangle and a pocket for the filling. Spoon some filling into the pocket and fold the pocket up to enclose the filling. Brush skin with some flour paste to seal samosa. Heat enough oil for deep frying. Drain well and serve warm. Thanks Anne, trying to make it stress free. Son now upset with me and had been hiding in his room with the PSP stuck to his face. This samosa is nice. if you have chance, try it. gosh the samosas look really good and simple to make. i usually just eat the potato only ones but the daging sounds pretty enticing! 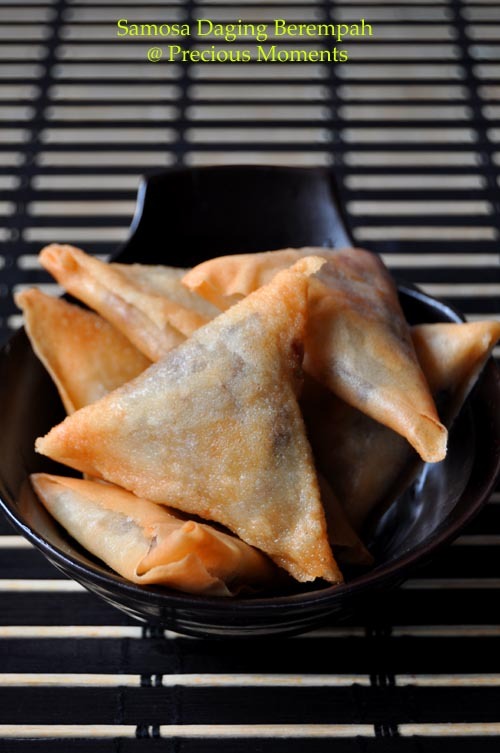 thanks edith for sharing this samosa recipe. Me too was not exposed to malay cooking as much as i do now as sometimes i go thru blogs and learn abt the dishes..infact i would really love to learn to cook malay and indian dishes more.